Cormach Evans is a proud Yorta Yorta man and the founder and creator of Strong Brother, Strong Sister, an Aboriginal youth mentoring organisation, which was created on Wadawurrung Country in Geelong. Founded in May 2017, Strong Brother, Strong Sister is creating culturally appropriate safe spaces for Aboriginal young people to access and thrive within, so that they can achieve excellence. 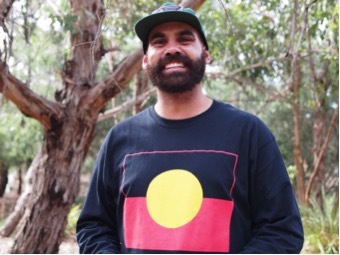 His organisation offers one-on-one mentoring to Aboriginal young people in out-of-home care, group workshops for schools, leadership programs and an Aboriginal surfing team. It is also creating youth groups for Aboriginal young people across Australia. His programs have involved over 450 Aboriginal young people in the Victoria in the last 12 months. Cormach is in the process of expanding Strong Brother, Strong Sister’s programs throughout Australia so that all Aboriginal young people can access these services. “All Aboriginal young people in out-of-home care should have an Aboriginal Mentor as part of their cultural plan,” says Cormach. “Strong Brother, Strong Sister is making sure that this is happening. “In the last 10 years, the number of our children in out-of-home care has doubled. That’s just not good enough, full stop. Strong Brother, Strong Sister is a driving force for our people to advocate for our children who are being removed from family, community and culture. We are making sure that our young people are being listened to, are returning back to family, community or kin, and are staying connected to their culture through positive mentoring. “From our programs we are seeing first-hand kids that are returning back to school, kids with mental health issues that weren’t leaving the house for quite some time but are now leaving the house,” says Cormach. “They’re also engaging in community events and thriving in their leadership groups which is amazing to see. We have kids that were in the justice system no longer in that justice system, they’re stepping up, they’re in the workforce or they’re in training so they excel and it takes them to that next step, which is exciting for me to see. “For me this really is my driving force, I am a ripple effect of the stolen generation, and growing up with little connection to my identity, culture and community was difficult to face on a daily basis. It’s my mission to make sure no Aboriginal child will have to feel this way. It’s about having a sense of belonging.